Samsung has shown off its latest 3D Blu-ray Home Theatre system, with the HT-C9950W offering 'a new dimension in home cinema'. The Samsung HT-C9950W is billed as the ideal companion for the company's flagship LED 9000 series television and features touch control buttons, a premium volume wheel and slot-in disc loading. 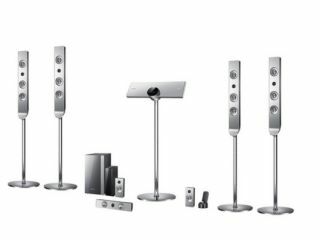 "The HT-C9950W, creates a new dimension in home cinema with jaw-dropping, life-like performance and a sophisticated design," states Samsung's release. "The 7.1 channel, multi-dimensional surround system includes a touch remote control, four floor-standing speakers, two satellite speakers, one centre channel unit, an active subwoofer with an anti-vibration solution and two HDMI inputs," the release continues. "The HT-C9950W includes a wireless LAN adaptor, allowing for easy access to Samsung Apps, or Samsung's AllShare to watch content from all other DLNA certified devices on the TV." The Samsung HT-C9950W is available now and has been priced at around £1,670.